Ingredients like macadamia nuts, edamame, hijiki seaweed makes this Rock Shrimp Poke dish a pure delight! 1.In a medium saucepan of boiling, salted water, cook the shrimp until curled and cooked through, about 3 minutes. Drain and let cool, then cover and refrigerate. 2.In a small saucepan, combine the soy sauce, vinegar, lemon juice, ginger, garlic, shallot, sesame oil, sugar and sambal oelek and simmer over low heat for 3 minutes. Pass the dressing through a fine strainer into a small bowl, pressing on the solids. 3.Put the hijiki in a bowl and cover with hot water. Let stand until rehydrated, about 10 minutes. Drain well. 4.In a small skillet, toast the sesame seeds over moderately high heat until the white seeds are golden, about 30 seconds. Transfer to a plate to cool. 5.Pat the shrimp dry with paper towels. Toss the shrimp with 2 tablespoons of the ginger-soy dressing and let it stand for 5 minutes. 6.In a large bowl, toss the tatsoi with the hijiki, sesame seeds, cucumber, shiso, edamame and chives. Add the shrimp and dressing and toss well. 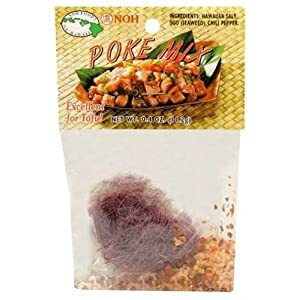 Season the poke with salt and toss again. 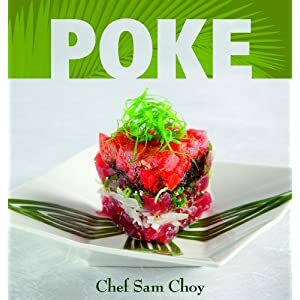 Spoon the poke onto plates, top with the macadamia nuts and serve immediately.